Download source: 30V, ADJUSTABLE CURRENT SINK LINEAR LED DRIVER AL5802 - Diodes, Inc. The AL5802 open-collector output can operate from 0.8V to 30V enabling it to operate from 5V to 24V power supplies without additional components ADJUSTABLE CURRENT SINK LINEAR LED DRIVER. Linear LED driver circuit diagram 30V adjustable current AL5802 has been designed for driving low current LEDs with typical LED current of 20mA to 100mA. It provides a cost effective way for driving low current LEDs compared with more complex switching regulator solutions. Furthermore, it reduces the PCB board area of the solution as there is no need for external components like inductors, capacitors and switching diodes. Figure 14 shows a typical application circuit diagram for driving an LED or string of LEDs. The NPN transistor Q1 measures the LED current by sensing the voltage across an external resistor REXT. 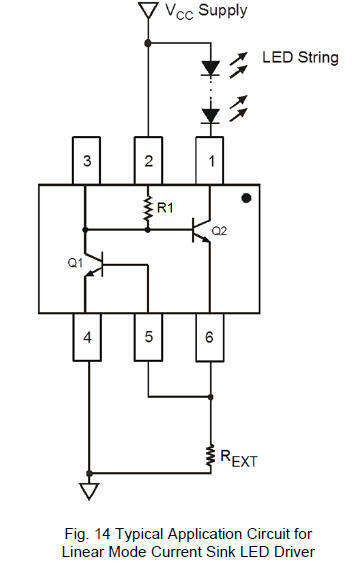 Q1 uses its VBE as reference to set the voltage across REXT and controls the base current into Q2. Q2 operates in linear mode to regulate the LED current.